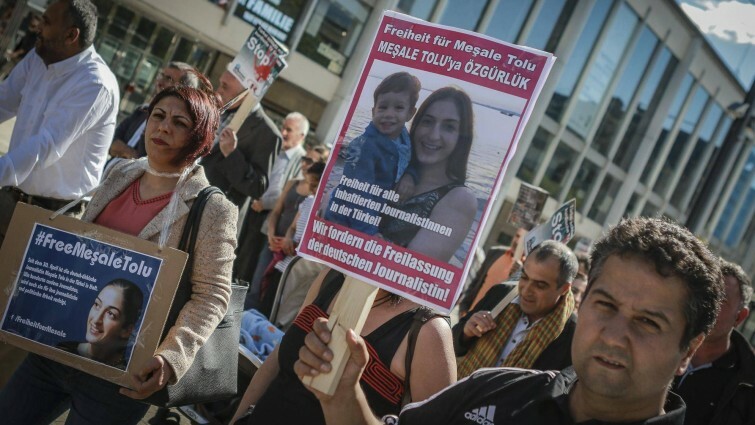 An İstanbul court on Wednesday ruled to continue the pretrial detention of Meşale Tolu, a Turkish-German journalist and translator accused of membership in a terrorist organization and publishing terrorist propaganda, the Stockholm Center for Freedom (SCF) reported. Tolu was detained in April 2017. Her husband was also detained and their three-year-old son has been living with his mother in jail for the last five months. Tolu is one of 18 people accused of membership of the MLKP, a communist party with links to armed Kurdish groups. They face up to 20 years in jail. “I have not committed any of the above-mentioned crimes and have no connection to illegal organizations. I demand my release and my acquittal,” Tolu told the court set up at Silivri Prison, near İstanbul, Turkish media reported. Tolu has also said it was unacceptable that she and her son had spent five months in jail. “Pretrial detention has become a punishment not only for me but also for my family and for my son,” she told the court. The court ordered that Tolu and five other defendants remain in jail pending trial, while releasing eight others. The next hearing will be on Dec. 18. German Foreign Minister Sigmar Gabriel demanded her release. “We demand a fair trial, based on the rule of law. Above all, what matters now is speed so that Meşale Tolu can be released as soon as possible,” he told the Bild newspaper in an interview published on Wednesday. Tolu is one of 11 German nationals in detention in Turkey, among them fellow journalist Deniz Yücel and human rights campaigner Peter Steudtner. The cases have added to strains in bilateral relations after Ankara denied German lawmakers permission to visit German soldiers serving at İncirlik Airbase. This article originally appeared in Turkish Minute on Oct. 12.